John Butler is almost unbearably hip. That’s a pretty big compliment. His lyrics are smart, tough and principled. He’s a great guitarist. Given the number of great guitarists in the world, that doesn’t hold very much weight. But it’s rare that I come across a set of music like this that really gets me excited. This is music that makes you want to get up and do something. You can’t pigeon-hole it. You’d have to listen to it and define it for yourself. I’d love to hear what other people’s thoughts are. One of the few comparisons I make is a couple of spots where his slide playing is reminiscent of Sonny Landreth’s; another big compliment. He’s using it as a flavor. Again: hip. A lotta, lot of flavors and textures here. According to Wikipedia he plays mostly amplified and processed acoustic guitars. …Wow! Cool. He’s a good singer, too. He sometimes sings like a rapper and/or raps like a singer, fast and rhythmical. The words aren’t always legible, but I’m not sure lyrics have to necessarily be completely heard and understood. There’s kind of an old joke about singers intentionally slurring the words. Back in the day, people would wear vinyl records down, trying to decipher them. It’s the feeling. When read separately, the words can lose their punch. It doesn’t mean they’re bad lyrics – they’re lyrical. It’s music. Anyway, the point is that it all adds up here to be very punchy singing, indeed. It expresses what it’s trying to express. And, hey. The CD insert has a handwritten libretto, with drawings even. It’s hip. Very hip. It’s Cool. It swings. That’s a style you don’t hear very much. You hear it a lot in jazz singers. You’ve gotta get it right. If it’s insincere, it’s transparently about style, not an individualistic expression. Some good ones that come to mind are Mose Allison, Gil Scott-Heron and Eddie Jefferson. Or think Billie Holiday. Timeless, right? Anyway, I dig hip. 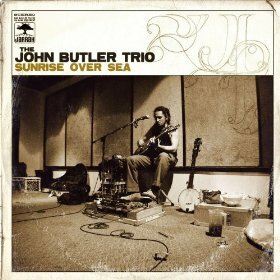 On this set, the John Butler Trio swing like a mother. The bass, drums and guitar play in unbelievably tight counterpoint that is ultra-syncopated. If you haven’t heard this set, check it out.